Donald Trump and Ted Cruz may be dominating national headlines, but there are other elections going on this year, and the level of nutty of many Republican candidates running for state office actually, as hard as it may be to believe, makes those two look like pretenders. 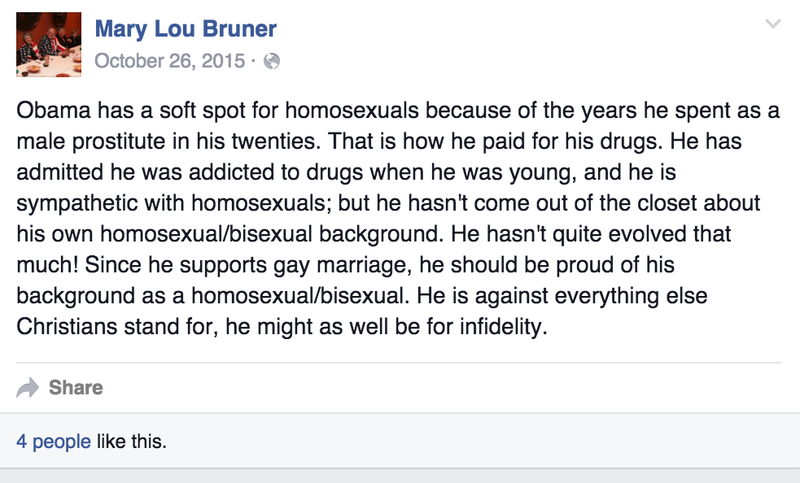 Take, for instance, Mary Lou Bruner, a wild-eyed right-wing conspiracy theorist who runs a very good chance of winning a seat on the Texas State Board of Education. She got 48 percent of the vote in a three person Republican primary, which means she'll be competing in May in a run-off against fellow Republican Keven Ellis, who only got 31 percent of the vote. Bruner's particular brand of battiness and the fact that she's winning with it tells us a lot about how much the conservative movement has become beholden to magical thinking and unvarnished bigotry. You can get an eyeball of Bruner's particular brand of wingnuttery from this 2010 video where she argued that "Middle Easterners" secretly bribing textbook publishers to inject pro-Islam propaganda into textbooks, presumably to convert hapless Christian schoolchildren. Since then, she's decided that what's needed to stop the imaginary Muslim conspiracy is to run for the statewide school board, which is already a den of Bible-thumpers, grifters, and people who think Moses should be considered a Founding Father. But even by the appallingly low standards of the Texas state school board, Bruner is out there. The Texas Freedom Network (TFN), an organization that fights the attempts by the religious right to turn the state into a de facto theocracy, has been on the case. In early February, they raised the alarm about some off-the-wall statements that Bruner had made. 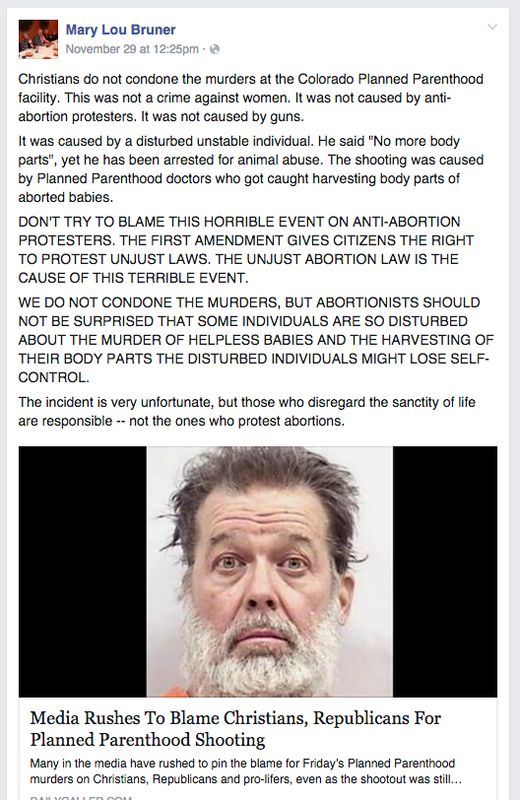 Bruner has all the standard issue right wing nut beliefs — the Civil War wasn't about slavery, climate change is an international hoax, dinosaurs lived with people — but she also has some interesting twists on the standard nonsense, including this lovely theory she posted on her Facebook page back in October. 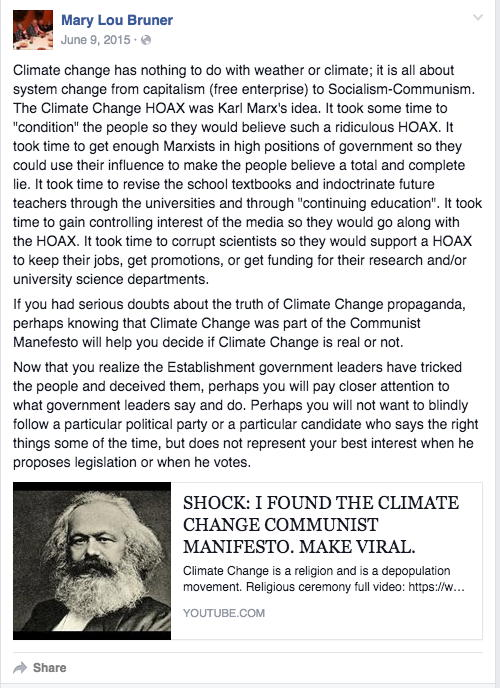 She also argued that Karl Marx had come up with the idea of climate change as a hoax to overturn capitalism. (In case you're wondering: Marx died in 1883. Even if you're stretching, the earliest suggestion of human-caused global warming was offered in 1896, but didn't really coalesce into a theory until the 1950s.) 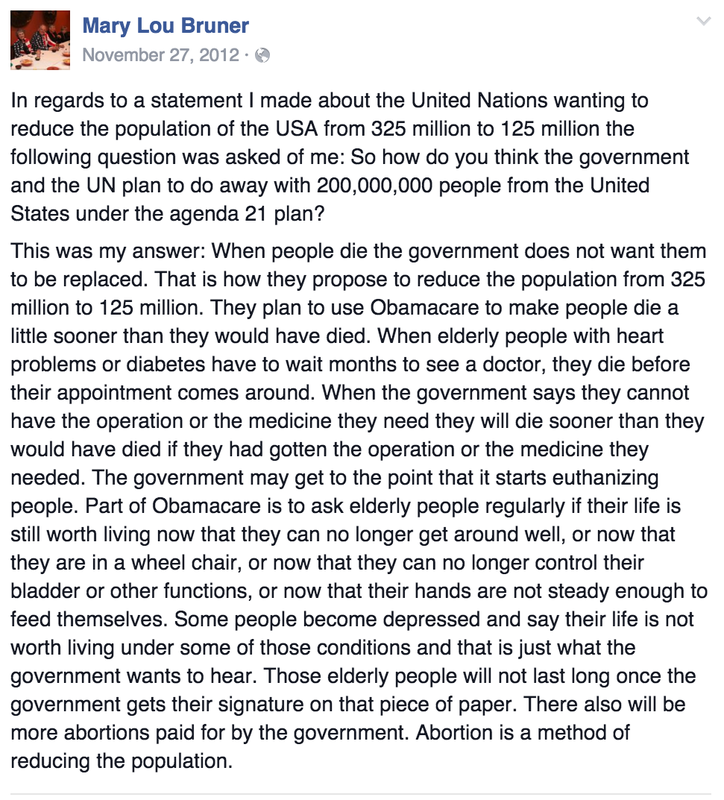 She definitely thinks that Obama is conspiring with the U.N. to genocide people, using Obamacare to do it. After TFN exposed Bruner's extremism, she appears to have deleted basically all of her Facebook feed, though she has caved to temptation and ranted on Feb. 25 that, "You are very naive if you believe a tiny river carved out the Grand Canyon." But, unsurprisingly, she's acting like she's the victim of some kind of anti-Christian conspiracy and getting very weaselly when asked about her wacky views by reporters. "I don't know, I guess I'm assuming it was true; you're assuming some people assume that it's false, I mean, who knows," Bruner told a local news station when asked if she really believes Obama spent his youth as a gay hustler raising funds for his supposed drug habit. And, in a hilarious example of the "liberals are the real racists/fascists/KKK" bit of conservative projection, she accuses the president of being a [sic] "hippocrite" because his family supposedly owned slaves, even as he, being all mean and liberal, won't let white Americans do. Republicans also get their share of suspicion, unsurprising in our age of Donald Trump being used by the nuts to take over the party: She accuses George Prescott Bush of selling the Alamo to the U.N. and suggests Paul Ryan might be in league with Muslim terrorists because of his beard. Bruner runs a very strong chance of winning this election. She's running first in the primary and if she wins it, she will almost certainly be elected in a district that mindlessly votes for Republicans over Democrats. Her existence is yet another example of how chickens are coming home to roost for a Republican party that has pandered to and empowered racists, religious fanatics, and all manner of reality-challenged sorts, prioritizing power madness over the nation's future. Bruner is the logical next step in a multi-decade war on public education being waged by the right. So much of modern conservatism is built on challenging empirical reality and insisting that their lies, ranging from "slavery was no big deal" to "climate change is a hoax" to "God created the earth in seven days", should be treated like our collective truth, despite the fact that these beliefs are not, you know, true. It's easy to see why conservatives target public education in their mission to beat back the forces of empirical reality. Nowhere will you find a better indicator of what a society agrees is "true" than what we teach kids in school, and so a huge amount of effort has been put towards the hope that lying to kids about reality long enough will somehow make those lies a little truer. Texas is ground zero for these efforts, because Texas is one of the biggest textbook buyers in the country. Textbook publishers aren't going to make different textbooks for every state, so if Texas sets a standard — even if it's anti-biology or arguing that the Civil War wasn't really about slavery — textbook publishers will write textbooks meant for the whole nation with an eye towards not offending the right wing nuts of Texas. Subsequently, the past few years have had nationally covered battles over issues like whether or not Texas schoolchildren should be taught ridiculous lies, like evolution is disputed in science or that the Founding Fathers based the constitution on the Bible. Under the circumstances, it seems a bit silly parsing the more well-packaged lies being touted by the religious right and the next-level battiness being rolled out by Bruner. Once you take on the project of denying that reality should shape our understanding of what truth is, as the religious right has done, then there's no way to put a limit on it. If it's okay to believe that evolution and climate change are hoaxes being perpetuated by scientists, then why is not equally okay to believe that Obama was a gay prostitute drug addict? Both beliefs are formed around wishful thinking and an overt rejection of evidence, after all. Once you open the door to the idea that what you want to believe matters more than what is, there's no way to put a limit on the nutty ideas people will spin out.